Tom Mitchell’s term as a Liberty Township trustee comes to an end on Dec. 31. His last trustee meeting was Nov. 20 where he shook hands, gave and got hugs, and had a few photos taken with residents. Trustee Shyra Eichhorn, right, honored Mitchell with a plaque to commemorate and recognize his work as a trustee. 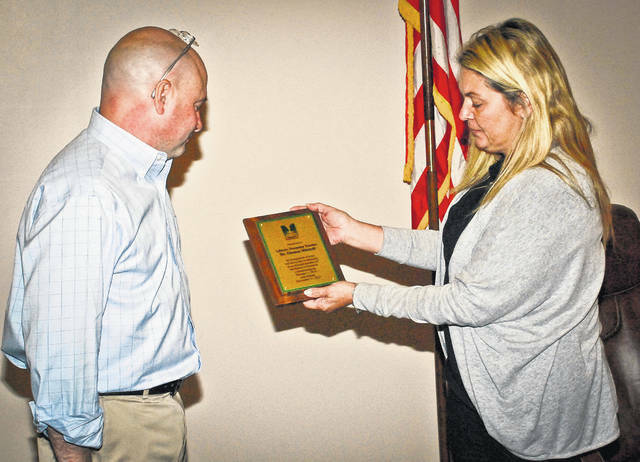 Before Liberty Township’s trustee meeting on Monday, Trustee Tom Mitchell said his goodbyes as a trustee by shaking hands, exchanging hugs, having photos taken with residents, friends, and members of the Liberty Township Fire Department. Mitchell’s term as a Liberty Township Trustee comes to an end on Dec. 31. He made the Nov. 20 meeting his last. Mitchell said that he stands by all of the votes he cast as a trustee over four years, except for maybe one or two that he might have second-guessed, but he felt good about his experience on the board. Mitchell said as a board, the three might have not always voted together or agreed on every issue. He said there had been times Trustee Melanie Leneghan and he had voted against Trustee Shyra Eichhorn and sometimes he and Eichhorn had voted together opposing Leneghan. However, “in general we’ve voted as a majority the best we could when we could,” he said. “I think in any job it takes you a year or two to figure out how to do it,” Mitchell said. Mitchell said when he was running to be a trustee, he didn’t realize the amount of time it took to do the job. He thanked all those who supported him by picking up the slack in his absence because of his trustee obligations. “I’ve grown as a person and as a leader because of being part of this board,” he said. At the end of the meeting, Eichhorn presented Mitchell with a plaque.